Native Instruments has launched the new Maschine Studio MIDI-controller production system along with the new version 2.0 of its software and we&apos;ve got our hands on both for a full written and video review. 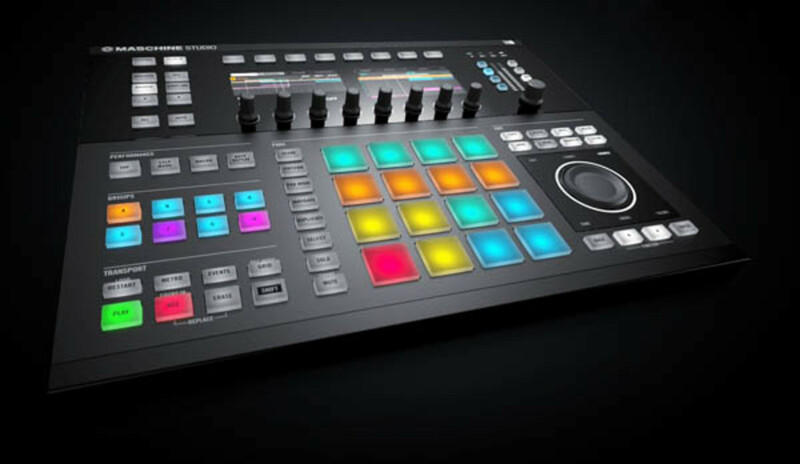 The new Native Instruments Maschine Studio hardware is bigger than both the Maschine and Maschine Mikro and provides best-in-class control with two new hi-res color displays, a new edit section with a large jog wheel, and the same responsive 16-multi-color backlit velocity-sensitive drum pads. The Maschine 2.0 software provides lots of improvements to the user interface and works better and faster on all three Maschine Production devices. Check out the full HD-Video and written reviews below to see if this powerful production controller is for you. 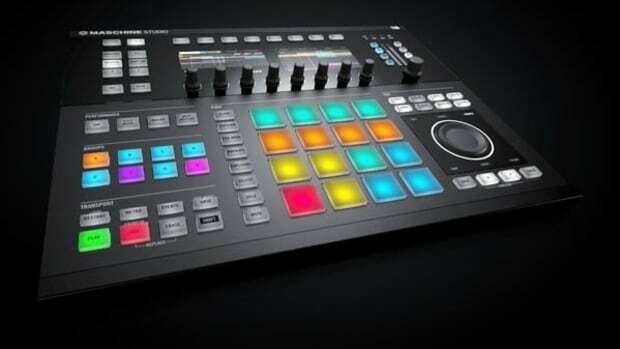 A few short months ago, Native Instruments released the new editions to its Maschine lineup which were MK2 upgrades to the originals. We reviewed the Maschine with the 1.8 software and we found that the production setup was powerful and worked well for making beats on the fly but lots of the functions and features require the producer to use lots of time interfacing with the computer instead of the hardware. The new Maschine Studio aims to take the focus back from the computer screen and puts it back towards the performance hardware by including two new large high definition screens and lots more buttons to control vital beat-making features. Along with the new hardware, Native Instruments also introduced version 2.0 of the Maschine software, which was built to take advantage of the new functionality included in the Maschine Studio as well as offer some new effects and features not included on Maschine 1.8 such as the new Drum Synth. Current Maschine and Maschine Mikro users will be able to download the new software update for $100 from the NI website to take advantage of the new features and functions found within. The familiar Native Instruments durable build quality is also on display with the new Maschine Studio. The Studio has a mostly hard-plastic construction on the bottom and the sides with a brushed-aluminum top panel near the drum pad region and a shiny top portion around the dual screens. The shiny material is a dust and fingerprint magnet, but the overall construction feels sturdy and strong. The Maschine Studio has a natural angle towards the user when its laying flat, but NI decided to integrate two foldable rear feet to raise the device to a comfortable height for even easier manipulation of the controls. This is a nice upgrade since users of the smaller Maschine and Maschine Mikro will need to purchase an extra stand to get the same effect. The Maschine Studio is available in Black (as reviewed) and a White edition. The Setup of the Maschine Studio was fairly easy. The best way to download and install all of the necessary software components is to go to the NI website and register both the software and hardware serial numbers provided in the box and download all necessary files from the Service Center. Users get the Maschine 2.0 software, hardware drivers/updates, Kontakt for sampling, Reaktor for instruments, and over 8GB of sounds to get the user started on the music production journey. 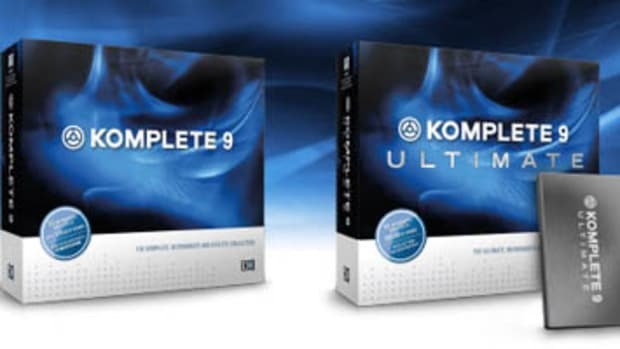 NI also has included a $25 voucher for users who want to purchase the Komplete 9 or Komplete 9 Ultimate software suites which provides thousands more sounds and instrument kits that can be easily loaded into the Maschine software for beat-making. Since these files are relatively large it will take some time to download and install the software, but from there the setup process is simply plug and play. The user must then select the appropriate soundcard from the preferences in order to hear the sounds and beats. The Maschine Studio is also a fully MIDI-mappable performance device meaning every knob and button can be programmed to do exactly as the user sees fit. This MIDI controller can be used with other software as long as the user is willing to take the time to map it out themselves. It’s easy to switch back and forth between MIDI mode and Maschine software mode by holding the shift key and pressing the channel button in the upper left-most corner. The original Maschine and Maschine MK2 only have one MIDI input and one MIDI output. The new Maschine Studio has one MIDI input and three MIDI outputs meaning you can connect even more devices such as other keyboards or controllers that will maintain the same MIDI clock timing so everything is in sync when in use. There are two footswitch connections, a USB port, and a power adapter port on the back. The power connection is absolutely required for use with the Maschine Studio while the Maschine and Maschine Mikro are both USB powered. One of my minor gripes with the unit is that there is no built in soundcard interface that allows the user to directly connect speakers or headphones for output nor are there any line-level inputs for hardware sound capture for sampling. This would have been a nice addition for the flagship controller, but I understand NI’s reasoning for leaving it out. Most studios and producers have their own soundcards or setups already in place and this is a dedicated controller to handle the software functions. The Maschine has dual screens and the Maschine Mikro has a single screen, but none of them are as big, crisp, and bright as the dual screens found on the new Maschine Studio. These dual screens found on the Studio are a game-changer. The inclusion of these brightly colored, high-resolution screens means that users only have to look up at the computer screen once in a while since most of the functions and features are duplicated right on-board. These screens serve many different purposes with the buttons and knobs on the top and bottom of the screens used for making adjustments and changes that correspond to what is being displayed. When the Arrange button is pressed, the left screen shows the current Scene or Pattern arrangement while the second screen shows a zoom-in view for more detail. When the Mix button is pressed, the user can see an all-new Mixer view of the different sounds and the volumes can be adjusted using the knobs below the screens. When the Browse button is activated, the user can see the artwork of the instruments loaded in Maschine on the left while the screen on the right shows the actual sound or kit that can be loaded into the pads. When the Sampling button is pressed, the user will see a snapshot of the sound in the left screen while the right screen shows more details and presets that can be changed to customize the sound for the application. In the sample view, users can also view and edit waveforms so that the sound is just right. These are the four main functions of the dual screen setup, but there are other modes and views that can also display on-board such as a quick pattern view or pad mode to give the user even more feedback. The all new Level Meters are in the top right corner of the Maschine Studio. These meters are bright and crisp and show the user the volume levels of the selected source. Surrounding the Level meters are the buttons used to select their mode. There is an oversized volume knob right below the meters to easily adjust the levels to the desired amounts. The user can see the Master, Group, Send, Cue, IN1, IN2, IN3, or IN4 volumes and make adjustments at a glance. The Maschine Studio has the same upgraded pads as the Maschine MK2 and Maschine Mikro MK2. The 16 pads are in their familiar 4-by-4 layout and they are very sensitive and highly responsive. They are velocity-sensitive pads but the sensitivity levels can be adjusted within the software. No matter where I drum on the physical pad, the sound will always react accordingly. Two-finger drumming on one pad is also a breeze with this device. These pads feel firm but they have just the right amount of “give” to them so you know they are being activated. These 16 pads are all backlit and can be set to any desired RGB color as a quick visual indicator of the pads’ use. Native Instruments makes this clear to the user by having the MK2 run an impressive looking rainbow effect across the device when it is first powered on. It serves as a nice introduction to the product and is sure to turn heads if you power on in a crowded room. Each layer of the pads is called Groups. Groups allow the 16-pads to have another layer to them so they can be used to control different sounds and instruments. There are unlimited groups in the new Maschine 2.0 but there are buttons A to H so the user has immediate access to 8 groups on the fly. The Group buttons can also be changed to a desired color so the user knows exactly what sounds are located in what groups. 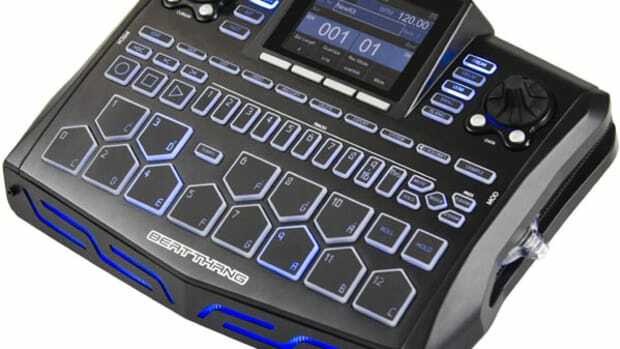 Just as with the Maschine MK2, the Maschine Studio has the ability to assign sounds and scenes to different colors and have those colors reflected in both the hardware and the software. All of this color-coding makes life so much easier for performing, editing, and browsing through a song. All of the other buttons on the Maschine studio have a single backlit to them and they also have a faint audible click so the user knows that the button was pressed. Just to the left of the pads there is a column of buttons that are used to control the pad functions for use and editing. These buttons are Scene (showing a quick look at the different scenes in the current song), Pattern (shows a quick look at the different patterns in the song which are represented on the pads), Pad Mode (to change the mode of the pads), Navigate (to navigate through a track), Duplicate (to copy a pattern), Select, Solo (to mute all other pads), and Mute (to mute the current pad). There are also transport buttons in the bottom-left corner which are responsible for playback, recording, restarting the track, Looping a section, erasing a section and providing a BPM count-in or Metronome note so the beat is always right on tempo. Also to the left is the Performance section which holds the Tap button (for tapping in a precise BPM), Step Mode, Macro, and Note Repeat (which allows a sound to be continuously applied in succession at a specified interval). Be sure to see our full video review for a quick demonstration of these button features. The new Maschine Studio has a huge Jog Wheel encoder to the bottom right that’s used for Editing, Channel functions, browsing, Tuning, swinging, and volume control. There is a white LED ring around this jog wheel so it’s easy to find in low light scenarios. The jog wheel, (like the dual screens), take on different functions depending on the current mode that the Maschine Studio is in. The Jog wheel is an endless encoder that can be pressed to make selections and has notches when turning it so each movement gives feedback. Below the jog wheel are the navigation buttons Back, left arrow, right arrow, and Enter to control on-screen actions. Just above the jog wheel, there are buttons for editing which are mostly self-explanatory. There is the Copy, Paste, Note, Nudge, Undo, Redo, Quantize, and clear buttons all handy for making quick on-the-fly adjustments during a performance or mix. All Maschine users can now take advantage of the new Maschine Software Version 2.0 which includes a number of new features and enhancements over the previous version. The color coding of sounds and scenes is still here from Maschine 1.8, but its taken a step further with all of the color coding also present on the dual displays. The Maschine 2.0 software is also faster than the last version of the software and runs more smoothly with the hardware. The new multi-core programming allows processes to run in parallel. There are also unlimited groups available in the software so sounds and samples can be layered until one’s heart is content. The Maschine 2.0 software GUI looks a lot like the interface on the dual screens of the Maschine Studio so switching back and forth between the two will be a breeze. The Maschine 2.0 software also comes with a powerful built-in drum synth that allows users to create and customize drum sounds to get the perfect arrangement. As previously stated, Maschine 2.0 comes with over 8GB of sounds which includes 8627 samples, made up of 445 full drum kits, 388 multi-sampled instruments, 403 sliced loops, 1200 patterns, and 38 projects. The Maschine Studio also comes with Massive (over 1300 synth sounds), Reaktor Prism (370 synth sounds and 50 FX presets), Scarbee Mark I (electric Piano), and Solid Bus Comp (effects) to get the user started. Here at DJBooth we were big fans of the original Maschine, and the Maschine MK2, so this new flagship Maschine Studio model is no exception. The Maschine Studio is a very powerful MIDI controller which can be used for sampling, sequencing, mixing, drumming, and more. It comes bundled with the new Maschine 2.0 software, over 8GB of sounds, and a powerful Drum Synth tool that allows users to alter and customize drum kits to suit their needs. The biggest update is the inclusion of the large beautiful high-resolution dual color displays that allow the user to focus on the hardware rather than the computer when performing. The new oversized jog wheel for editing, channel functions, and navigation is a nice addition. The build quality of the Maschine Studio is strong and sturdy and the integrated elevated stand puts the Maschine Studio at perfect performance height on a desktop.. The 16 Velocity-Sensitive Performance Pads are mutli-color RGB backlit and have the perfect response and tactile feel. On the downside, the Maschine Studio’s $1000 price-tag may be steep for some and there is no internal soundcard to connect audio outputs (speakers/headphones) or inputs (Audio devices). However, if you are a fan of the Maschine hardware layout and their easily integrated software offerings for production and music creation, then the Maschine Studio is an obvious choice for all of your production needs. Also, If you are in the market for a production center-piece the Maschine Studio should be on your short list of candidates.